The universe that we live in has only three spatial dimensions. We are limited to length, width, and height, and we can only travel along three perpendicular paths. This page attempts to explain the properties of a hypothetical universe with a spatial fourth dimension. While people generally call time the 4th dimension in the universe we live in, time will be the 5th dimension in my hypothetical universe. Many fascinating possibilities exist when a spatial fourth dimension is present. Several types of wheels are possible, very complex machines can be built, and many more shapes are possible. Objects can pass by each other more easily, but they are harder to break into multiple pieces. Energy reduces much faster with distance than in the 3rd dimension, so both light and sound are weaker. Much more things can be compacted into a small space, but its much easier to get lost. Step 1 – Zeroth Dimension. Imagine a point in space. It is a 0-hypercube. A point is zero dimensional because it has no width, length, or height, and is infinitely small. Every point is exactly the same and has the same measurements, because it has no dimension. Below is a picture of a point, representing the zeroth dimension. Step 2 – First Dimension. Take the zero-dimensional point and extrude it in any direction, creating a line segment, which is a 1-hypercube. All line segments are one-dimensional because they differ in size by only one measurement, length. They all have the same width and height, which is infinitely small. If you expanded the line infinitely, it would cover one-dimensional space. Step 3 – Second Dimension. Now take the line segment and extrude it in any direction that is perpendicular to the first direction, creating a square, which is a 2-hypercube. All squares are two dimensional because they differ with each other in size by two measurements, width and length. They all have the same height, which is infinitely small. All of the edges are the same length, and all of the angles are right angles. If you expanded the square infinitely, it would cover two-dimensional space. Step 4 – Third Dimension. Take the non-infinite square and extrude it in a third direction, perpendicular to both of the first two directions, creating a cube, which is a 3-hypercube. 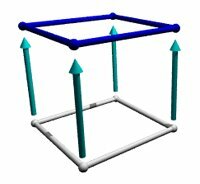 All cubes are three dimensional because they differ with each other in size by all of the three measurements that we know of – width, length, and height. Just like the square, all of the edges within a single cube are the same length, and all of the angles are right angles. If you expanded the cube infinitely in all directions, it would cover three-dimensional space. 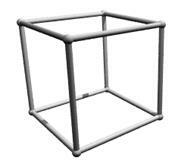 from this extrusion of a cube into tetraspace is called a tesseract, which is a 4-hypercube. 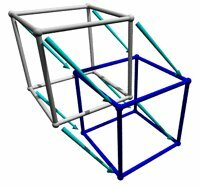 All tesseracts differ from other tesseracts in size by four measurements (equal to each other within a single tesseract) – width, length, height, and a fourth measurement, which I call trength. Looking back to the previous n-dimensional cubes, they all have the same trength, which is infinitely small. Just like the cube and square, all of the edges within a single tesseract are the same length, and all of the angles are right angles. 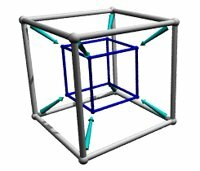 If you expanded the tesseract infinitely, it would cover four-dimensional space. ow of the skewed tesseract’s edges. The result is a shape that has two cubes with their vertices connected together. In the orignal shape, all of the edges within the cube cells are the same length and have right angles with each other. However, they don’t have right angles with the teal connection edges, and the teal connection edges are slightly longer than the cube cells’ edges. projection is a simple cube. This didn’t happen with the inner projection, because that projection was a perspective projection.This last step of trying to view a tesseract shows the difficulties in portraying objects from tetraspace within the limitations of realmspace – there is an extra perpendicular direction that we can’t depict within our own space without distorting the original object. Because of these problems, it takes many examples in order to begin understanding the nature of the fourth dimension. You have now seen a glimpse of the fourth dimension. This is only the beginning – there are many more aspects of the fourth dimension to explore. In the rest of these pages, THERE ARE many properties of the fourth dimension – rotation, flatness, levitation, shapes, water, and many others. By the time you are finished, you should have learned many interesting things about the fourth dimension, and maybe you will have even made some discoveries of your own. AND THIS IS WHY I SAY 3RD EYE’s ARE BLINDED TO THE 4 EYES YOU TRULY HAVE! Now lets give a example picture that many can see, feel and understand. In ELLAMENTAL All forms of education or erudition : extensive knowledge acquired chiefly from books : profound, recondite, or bookish learning. —Also through experience of living our own life as well; rather it be through the hard knocks of street life or academia it is all an EXPERIENCE OF one’s own that can naught be taken away by any one else. What ever it is that we have to do to achieve our personal goals takes; DEVOTION, DEDICATION, DISCIPLINE, DESIRE & DIVINITY!